One of the oldest books in the Bible is the book of Job, where Job declares God has “inscribed a circle on the face of the waters at the boundary between light and darkness.” (Job 26:10, ESV & NASB) This same expression is also used in Proverbs 8:27, which also refers to God having “inscribed circle on the face of the waters” (seas). There is only one geometric solution which enables the earth to have a dark and light side demarcated by distinct circular boundary: the earth must be a sphere rotating against a source of light coming from one direction. Does such a curved line exist? Yes! 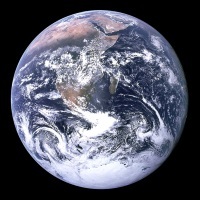 It is shown in this photo taken from space. To modern scientists this demarcation line is known as the terminator. It can not only be seen from space, but is sometimes be seen when flying at a high altitude. The Hebrew word translated in these passages as circle is chuwg, which means circle, curve, vault or sphere, or as verb meaning to draw a circle. In other words, it indicates “roundness”. 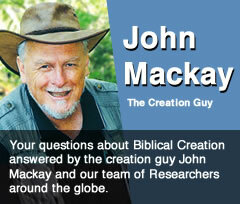 The idea that the earth is a sphere is not the result of modern science. Ancient people deduced that the world was round because they observed objects that moved a long way away disappearing over the horizon, or appearing to rise up as you approached them. They also noted the differences in the lengths of shadows in different locations on the same days. 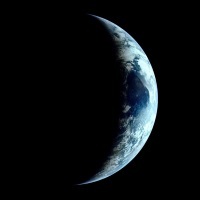 If the earth is a solid sphere objects such as a tower or a pole projecting straight up in a region where the sun is directly overhead will not cast shadows, but as you move away from this point the earth is curving away from the sun, and therefore objects are tilted away from the sun and will cast longer and longer shadows. The ancient Greek scholar Eratosthenes (276 BC – 195 BC), who became head librarian at Alexandria, used these observations to calculate the circumference of the earth quite accurately. So it’s time for a punch line: the modern attitude that ancient people ignorantly believed the world was flat is little more than a modern myth designed to make us think we are superior. Over the last two centuries the increase in international travel, by ship and later by aircraft, has affirmed that the world is a sphere. The most direct, and therefore most fuel efficient routes for long haul shipping and flying, are called the “great circle” routes. These routes follow the curved circumference of the earth, rather than straight lines on a flat map. In these days of expensive fuel and tight schedules, transport companies have to get this right, so they are not inventing these curved routes based on a false belief. Military pilots also know that if they want to fly below the enemy radar then one way of doing it is to be 50 mile out from the radar station flying low near the ground. The reason is radar beams travel in straight lines so they will travel above the horizon after about 50 miles because the earth is curved, making to possible to ‘go below the radar’. If the earth was flat radar would detect planes to the limit of the beam strength for hundreds of miles. Cernan was right – they were not the first to discover this. Isaiah’s and Job’s statements said it thousands of years ago. How good to be reminded that God described the “circle of earth” long before we started flying or sending out space probes.